At the 22 of September 2009, I got a phone call from my friend, “Blue”. She told me that her friend from Estonia has come to visit her and asked me if I’d like to come and meditate with them. She said her intuition has told her to call me. When we gathered at Blue’s house, none of us knew what we were going to do together. Blue mentioned that her friend, “Red”, used to be a Lemurian, in a previous life. I knew that Blue and I were ex Atlantians. The minute she mentioned her friend’s origin I knew what we should do: unite the crystals of Lemuria and Atlantis. I also suddenly knew that Red was an ex Lemuria priestess and that Blue was an ex Atlantian priestess. As many of you know, mother Earth has moved into the Crystal energy era on 9.9.09. 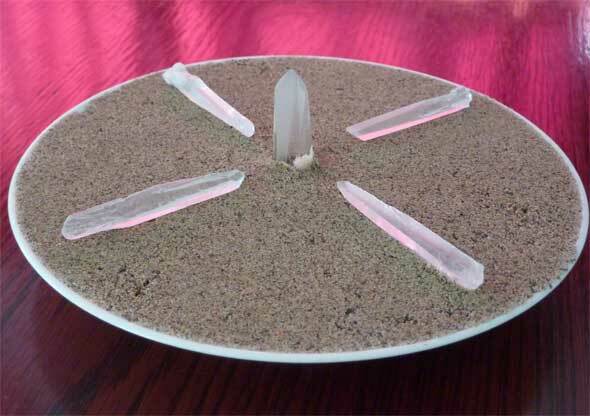 It was time to unite the male and female energies of the crystal network. We called upon the Lemurian and Atlantian priestesses and asked them to join us in the meditation, and help us and protect us from harm. Then we went on two separate trips: Red went to the Lemurian temple and connected her heart to the Lemurian crystal energy. Blue went to the Atlantian temple and connected her heart to the Atlantian crystal energy. Then they connected their hearts together and joined the two Crystal energies into one. They then sent the unified energy to all of Humanity until the Atlantian and Lemurian energy nets became aligned and unified into one net. Blue said that two energy spirals has started in her and that the spirals has unified the right and the left side of her brain into one. I felt the same effect in my body as well. A week later we met again and meditated again. This time we did some shamanic traveling together. When I returned home that night I didn’t feel well. I went to sleep and woke up in the middle of the night with a huge pain in my abdominal area and new memories from my life in Atlantis. for a few years now, I knew that I was the commander of the Atlantian army and hence also member of the ruling council of Atlantis. Our decisions in the council have led directly to the fall of Atlantis. I have made my peace with that part of my life. That night, more memories from my time in Atlantis has surfaced: I remembered how we fought a war against Lemuria. I remembered how the Lemurians has killed my son, who was a soldier as well. I remembered how I went on a personal revenge trip against the Lemurians. I remembered how the Atlantian crack divisions has landed in Lemuria and destroyed it. I remembered how we found out that destroying the Lemurians meant that planet Earth has lost her energetic balance and that because of that Atlantis will be destroyed as well. I remembered that we organized a massive evacuation of Atlantis and tried to save as many people as we could. My last memory is standing on a deck of a ship and watching my beloved Atlantis ink in a hail of Volcano eruptions.